The 2016 film adaptation Hidden Figures shined a light on NASA mathematicians Mary Jackson, Katerine Goble Johnson and Dorothy Vaughn, bringing there story to the masses who had previously overlooked them. It should come as no surprise that Black women in the work force were not operating on a level playing field. Although the work they were doing was often more mentally challenging than the men to whom they reported, these mathematicians had to excel to the upper echelons of their field to be considered even on par with their entry level male counterparts. 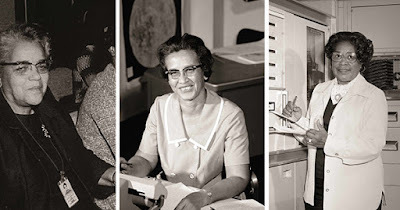 Despite not being given the high levels of respect and adulation their work deserved, the women persisted none-the-less, and provided invaluable contributions to the mission to the moon. The calculations of these three women, and the many Black women they worked alongside, played a crucial role in helping the astronauts attain orbit and then return home safe and sound.